Carnevale, Italian carnival, tops the list of February festivals all over Italy. In Catania, Sicily, the big festival is for Saint Agatha's Feast Day, the second largest religious procession in the world. Most other February festivals are in the first part of the month, prior to the start of Lent. Carnevale is one of the most popular festivals in Italy. Carnevale comes 40 days before Easter so the date changes each year (and festivals can sometimes start in January). See carnevale dates by year. The biggest Carnevale celebrations last for several weeks. Although Venice and Viareggio have the most well-known celebrations, Carnevale is celebrated all over Italy in a variety of ways. Some of the more unusual Carnevale celebrations are the orange-throwing battle in Ivrea, Albanian celebrations in Calabria, and a Roman carnival in the Aosta Valley. Saint Agatha, a martyr who died in 252 at age 15, is the patron saint of Catania, Sicily, and an exciting festival is held in her honor in Catania. The two-day procession, said to be the second largest religious procession in the world, begins February 4. 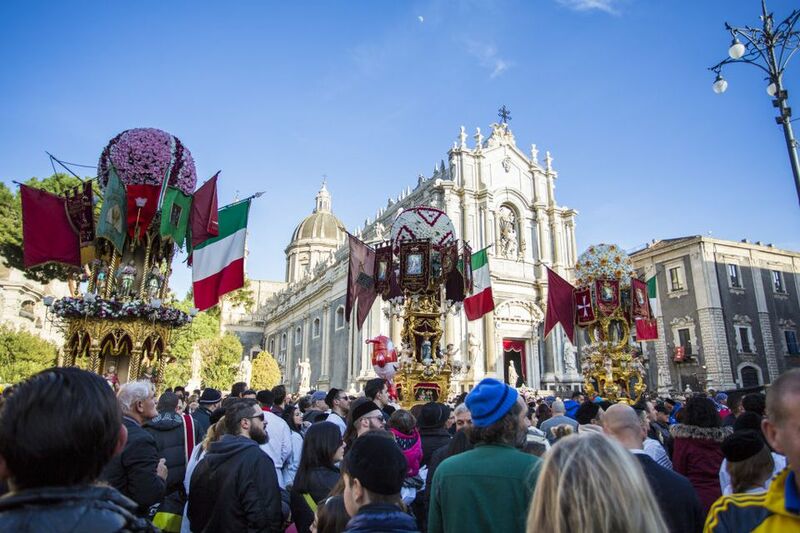 Following a mass at dawn, the statue of St. Agatha that houses her relics is placed on a fercolo, a 40,000-pound silver carriage, that will be pulled up Monte Sangiuliano by 5,000 men. The huge festival lasts for two days and two nights and as with most Italian festivals, there is also plenty of eating and drinking and a huge fireworks display at the end. Theresa Maggio gives a lively description of the Festival of St. Agatha in her very interesting book, The Stone Boudoir: Travels through the Hidden Villages of Sicily. February 3 is a minor celebration all over Italy. Saint Biago is the saint of the throat. It's tradition to eat leftover panettone with a glass of wine to bless your throat. In some places, Saint Biago Day is celebrated with parades, music, a special mass, or bonfires. In Mugnano di Napoli, near Naples, there's a huge fireworks display as its the home of one of the biggest fireworks companies in Italy. Almond Blossom Fair in Agrigento, Sicily, is a weeklong festival from the first through the second Sunday in February. The fair is combined with an International Folklore Festival with music, singing, parades, puppet shows, and open-air performances. Traditional Sicilian sweets made with almonds and almond paste are served. Balconies are decorated with flowers and people often wear colorful costumes. The finale includes a Sicilian cart parade and fireworks. Valentine's Day, February 14, is not celebrated as fanatically as it is in the United States but lovers do give lots of flowers and candy. The Umbrian town of Terni, who claim Saint Valentino as their patron saint, celebrate with a torchlight parade. Saint Faustino's Day, February 15, commemorates the saint adopted by single people in Italy. If you see a sign for a Saint Faustino Day party it's most likely a party for singles. Saint Faustino is actually the patron saint of Brescia. Feast Day of Saints Faustino and Giovita, February 15, is a big festival day in Brescia, in northern Italy. The day is filled with music, vendors, and food followed by a huge fireworks display at night. Saint Joseph's Eve, February 18, is celebrated in Rocca San Casciano in the Emilia Romagna region of northern Italy with a big parade followed by a competition between the two districts to see which one can build the biggest bonfire. Of course, there's also food and wine. San Remo Song Festival, Festival della canzone Italiana, is a huge five-night competition amongst Italian singers. Started in 1950, the San Remo Song Festival has made many Italian singers and songs famous. The song festival is currently held in mid-February rather than in March as it was in the past. Olive and Bruschetta Festival, the third Sunday of February, is celebrated in the Umbrian town of Spello. Farmers parade on decorated tractors and there's music, dancing, and food. Which Festivals and Holidays Are Held in Italy Each Month?